MOSCOW. (Rafael Arutyunyan for RIA Novosti) - Myth One: The accident at the Chernobyl Nuclear Power Plant damaged the health of tens or even hundreds of thousands of people. Facts: The Russian Medical Radiation Monitoring Register presented data on more than 500,000 people we monitored at an international forum in Vienna, Austria, held 20 years after the disaster. The world's largest database of relevant information, the register contains nothing but facts, which are impossible to ignore. It only monitors the serious consequence of the disaster, thyroid carcinoma in children, caused by failure to take specific measures. They include the prevention of iodine deficiency, and limits on the consumption of locally grown foods. They attribute 200 out of the 400 cases of thyroid carcinoma monitored by medical staff in the regions that were affected the hardest by the consequences of the Chernobyl disaster. There has been one terminal case. The World Health Organization wrote in a 2006 report: "A large increase in the incidence of thyroid cancer has occurred among people who were young children and adolescents at the time of the accident and lived in the most contaminated areas of Belarus, the Russian Federation and Ukraine. This was due to the high levels of radioactive iodine released from the Chernobyl reactor in the early days after the accident. Radioactive iodine was deposited in pastures eaten by cows who then concentrated it in their milk which was subsequently drunk by children. This was further exacerbated by a general iodine deficiency in the local diet causing more of the radioactive iodine to be accumulated in the thyroid. Since radioactive iodine is short lived, if people had stopped giving locally supplied contaminated milk to children for a few months following the accident, it is likely that most of the increase in radiation-induced thyroid cancer would not have resulted." 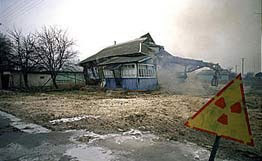 No other effects of the Chernobyl accident detrimental to human health were registered, which overturned all myths and stereotypes about its after-effects. The biological effects of radiation are measured in millisievert (mSv). Of the 2.8 million people who were close to the disaster zone, 2.5 million received an additional amount of less than 10 mSv, or one-fifth of the average global background radiation. Less than 2,000 people received an additional dose of more than 100 mSv, which is 33% less than the amount the residents of Finland, Belgium or Russia's Republic of Altai receive annually. For this reason, there are no - and cannot be any - other consequences of the disaster other than the above-mentioned thyroid cancer. It should be noted that the death rate from cancer that is not connected to radiation among any given group of 2.8 million people, irrespective of their place of residence, is between 4,000 and 6,000 annually, or 80,000-120,000 per 20 years. Another quotation: "For comparison, the high radiation dose a patient typically receives from one whole body computer tomography (CT) scan is approximately equivalent to the total dose accumulated in 20 years by the residents of the low contaminated areas following the Chernobyl accident." A relevant example is the bombing of Hiroshima and Nagasaki in 1945, which killed 210,000. Only 480 of the 86,000 survivors of the tragedy, who were regularly screened by the Japanese medical register since 1950, died of radiation-related cancer. Myth Two: The genetic consequences of the Chernobyol accident are horrific. Facts: During 60 years of research, the global science has not registered any genetic mutations connected with radiation. Moreover, 20 years after the Chernobyl tragedy, the International Commission on Radiological Protection, seeing that there are no reasons to speak about potential genetic risks, downgraded the related risks by 90%. Therefore, all rumors about the genetic consequences of the Chernobyl disaster can be dismissed as a groundless fantasy or lies. Myth Three: The movement of people from Pripyat and neighbouring areas was badly organized; they must not be allowed to move back to their homes. Facts: The evacuation of nearly 120,000 people was not organized in the most ideal fashion, but it was done quickly and professionally. It is also untrue that people received large radiation doses during the evacuation. I believe that they could be allowed to move back to their homes, after proper decontamination and cleaning of the territory, which was not done at all. Myth Four: Nature and the environment were damaged more severely than human beings. Facts: According to the radioecological paradigm, if human beings are protected, the environment is protected even better. When the health effects on humans are minimal, the effects on the environment are even smaller. In Chernobyl, the environment was damaged only next to the destroyed reactor, where trees in the so-called Red Forest received up to 2,000 roentgens. Since then, the environment there has fully recovered, which would not have been possible in a chemical disaster. Myth Five: Vast funds have been spent for the Chernobyl relief effort due to the enormity of the accident. Facts: Starting from 1992, Russia spent $3.5 billion in the aftermath of the accident. The money was mainly used for social benefits. In truth, this sum was not much at all, working out to be a mere $1,000 per victim over 20 years. But the amount was adequate to the risks incurred. It was true, however, that the accident slowed down the growth of the nuclear energy industry in the Soviet Union and other countries. Myth Six: Russia applies extremely high threshold values of acceptable radiation dose, the highest among other countries developing nuclear energy. Facts: Our standards of acceptable radiation exposure are, on the contrary, among the most stringent in the world. The radiation dose rate is measured in Becquerel (Bq). For example, Russia applies a normative of Cesium 137 content in milk, which should not exceed 100 Bq per liter. In Norway, they use 370 Bq per 1 kilo for baby food. Therefore, in Russia, milk containing 110 Bq is considered radioactive, while in Norway this level is one third of the allowed concentration. Myth Seven: Chernobyl was the first major nuclear accident. Facts: The first large-scale nuclear accident was at the Three Mile Island in Pennsylvania in the United States in 1979. There was a partial core meltdown in Unit 2 (a pressurized water reactor) due to technical breakdowns and personnel errors. Myth Eight: The Soviet government kept the accident secret from the public while knowing what had unfolded from the very first minutes. Facts: The situation was much more complex than certain "experts" would like it to be. Admittedly, the government did not make the news entirely public, but in the first place, it was the security system that proved unable to assess the situation adequately and promptly. What's more, Russia then did not have a reliable and independent radiation control system. There was no real time information on background radiation available at various distances from the plant. If there had been a proper control system, local residents could have avoided consuming poisoned food on the first few days after the accident. The government initially failed to realize what happened and what the risks were. As of now, each nuclear power plant has a network of automated background radiation control system surrounding it. Such networks enable the local officials or any other Internet user to follow radiation levels around the plant in real time. There was no such system then. Decision making required a lengthy analysis of the situation, which took too much precious time. Myth Nine: The peaceful nuclear energy programs are responsible for what happened because nuclear energy is uncontrollable; it will sooner or later burst out and destroy everything. Facts: There were three lessons to learn from the Chernobyl accident, and three reasons for what happened. First: The nuclear plant personnel failed to follow instructions and rules of the test program. This situation would not be able to take place today. Now, all personnel actions are tightly regulated in compliance with accepted international standards and documents. Hundreds of safety data parameters are being transmitted in real time from each unit of each plant to Energoatom's crisis center. This accounts for a control system fully independent from the personnel. Second: The structure and design of the Chernobyl reactor made it liable to accidents in the event of personnel human errors. Nuclear power plant security systems in Russia and other countries have been substantially improved since 1986, thus reducing the role of personnel. Third: The decision to transfer the control over nuclear power plants to the USSR Ministry of Energy was a mistake. This amounted to the violation of the entire safety regime in the nuclear power industry. The Ministry's personnel was not prepared to monitor the nuclear power plants. Myth Ten: The world is abandoning the use of nuclear power, as the Chernobyl disaster serves as a constant reminder of a possible radiation catastrophe. Facts: The ten leading nations of the world produce over 80% of nuclear power. Russia is falling behind all developed nations who have already adopted nuclear power industry development programs. Developing countries have even more ambitious programs on nuclear power development. The world is currently experiencing a nuclear power renaissance, as almost all leading nations of the world have realized that only nuclear power can resolve the issues of sustainable development, environmental protection, and climate change. We have scared ourselves with the Chernobyl disaster to such a degree that we need to understand how we managed to let that unfold. New Diet Taps into Pioneering Idea to Help Dieters Lose 12-23 Pounds within Just 21 Days!